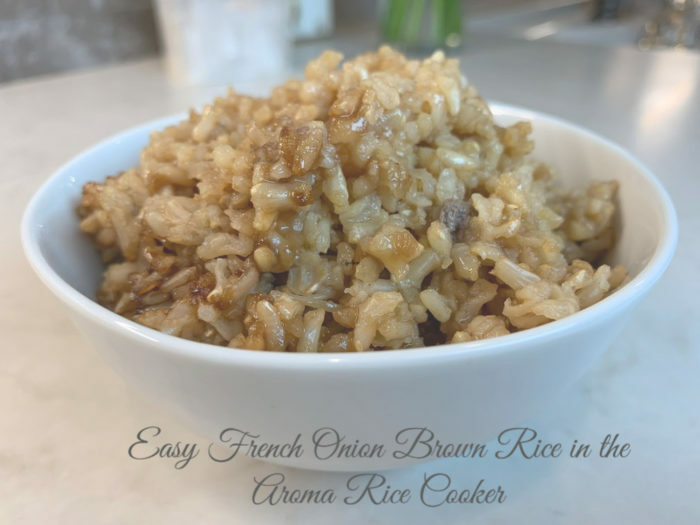 This easy French onion brown rice in the Aroma rice cooker is a healthy (but equally yummy) version of “church lady rice” or mushroom rice that is LOADED with butter! Those of you who are my age (50ish:-) and who grew up going to church in the South know exactly what I mean when I refer to “church lady rice” or “mushroom rice.” This rice was always on the menu at church potlucks. It was delicious, but most recipes called for two full sticks of butter! Yikes! The Aroma rice cooker is literally the way I’ve been making rice for the last 5-6 years. I do have an Instant Pot but still prefer using my Aroma rice cooker for rice. The delay timer allows me to throw the rice, water, and seasonings in the cooker, set the timer for when I want rice to be ready to eat, and come home to perfect rice every time. The Aroma rice cooker makes any kind of rice~white to brown. It is the easiest and most fail-proof way that I’ve found to make rice. When we have game day parties, I’ll always take a pot full of rice to put out for chili, soups and stews. I purchased my Aroma rice cooker at Costco, but the same one can be found on amazon.com and walmart.com. It is one of the kitchen tools that I can’t live without; I highly recommend it if you love rice and want it when you want it. 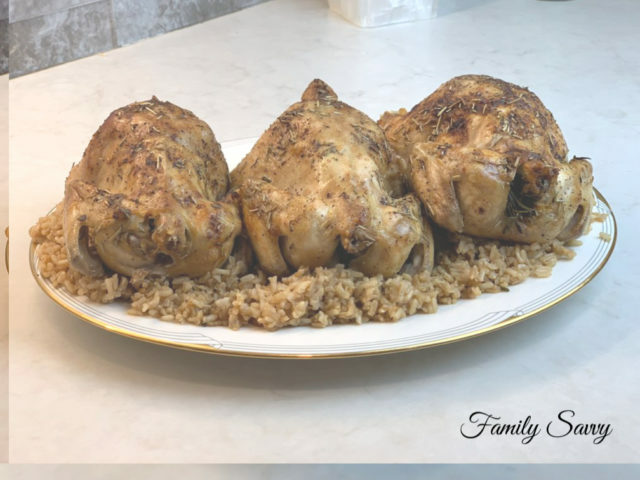 In the video below, I share how easy it is to program this yummy French onion brown rice in an Aroma rice cooker and come home to hot, ready to eat goodness! Cook’s note: This recipe uses a rice cooker, so for those who don’t have one, simply adapt this to your cooking method. I’ve used this Aroma rice cooker for so long that I don’t even remember how to make rice any other way! I hope this post is helpful and that you try this recipe. If so, I’d love to hear what you think. As always, thanks so much for stopping by. Be blessed, and stay savvy!!! French Onion Brown Rice: Easy, Delicious & Make Ahead! For 6 cups of brown rice, put 3 cups brown rice into the cooker insert. ill water to the #3 line marked inside of the rice cooker insert. Put the insert into the cooker, stir rice well, and close lid. Press "delay timer" once for every hour that you want to wait until rice is fully cooked. (If you want rice ready to eat in 4 hours, press delay timer 4 times). Hi tammy!! I used brown rice in this video so you would press brown rice. If using whiteâ€”just press white!! Hope you enjoy!! Let me know how it turns out!! Hi! I have the Aroma rice cooker and want to try this. Itâ€™s the first time I will use it. Would I just use the â€œwhite riceâ€ button to cook this? Thanks! Hi Elizabeth! This recipe, http://www.familysavvy.com/baked-rice-mushrooms/, tastes very similar but is baked~not stovetop. It is also more laden with calories, but it is delish!!! Is there a way to make this on the stovetop in a regular pot?